Perennial. Spring-blooming with sporadic blooms all summer. Beautiful silvery foliage with a bright display of magenta flowers. Zones 3-8. 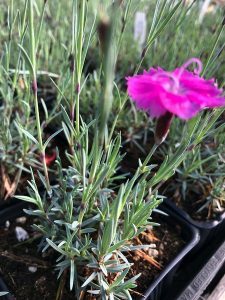 Use in rock gardens, containers, or as ground covers full Sun to light shade. Good drainage. Excellent companion plant to succulents.